February 21, 2015. Wondering what could possibly top our reindeer sleigh ride, Matthew and I headed off to explore Tromsø a bit more before grabbing supper. We’d spied a funicular across the water when we’d first arrived, and so we got instructions at the Tourist Information office on how to catch the public bus to the Fjellheisen (“the mountain lift”). Our bus crossed back over the bridge to the mainland and slowly wended its way through the dark streets of a sleepy subdivision, where the driver instructed us to get off by pointing to the mountaintop. After wandering around people’s yards for a bit, we finally found the pathway tucked between some garages and headed up to the platform where we waited for the funicular to arrive. 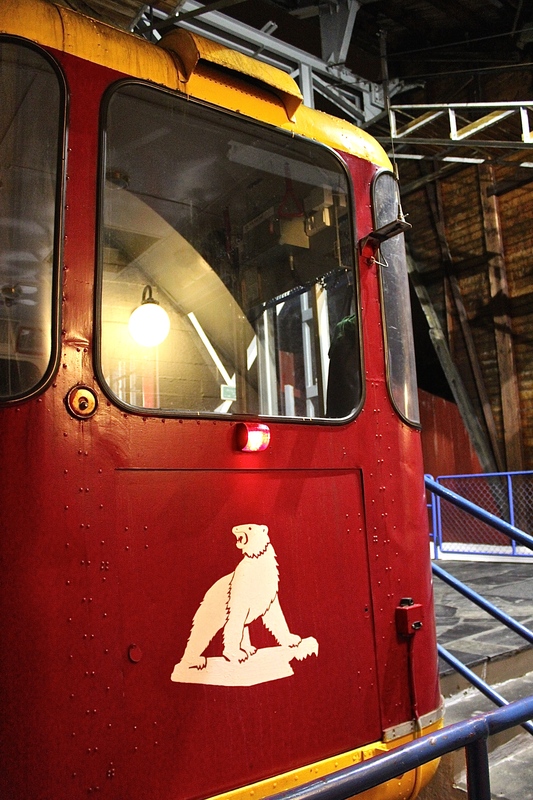 The funky Fjellheisen cable car, complete with polar-bear motif. The historic car was indeed a beautifully preserved relic of yesteryear, but I have to confess that as we dangled and swayed in the fierce wind, I had serious reservations about our safety. I am not at all fond of heights, and it didn’t help that the car’s 1960s vibe had me remembering the famous scene in Moonraker, where Jaws bites through the funicular’s cable and Bond has to partake in the usual fisticuffs and a helluva zipline ride to avoid a nasty fall. After a brief but rocky trip, no Bond villains in sight, we found ourselves atop Storsteinen Mountain, 1,380 feet above sea level. 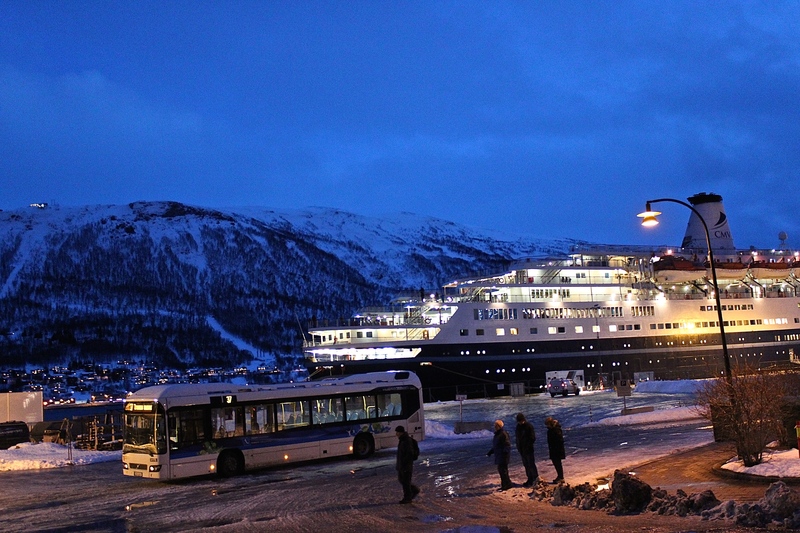 Our first stop was the cafe, where I tried to catch my breath and work up my courage before venturing out onto the cantilevered viewing platform for a better look at Tromsø by night. Finally, Matthew pried my fingers off the railing and dragged me out the door. Look closely, and you’ll see the wind-driven snow that stung our faces and threatened to knock us to our knees. Three steps onto the platform and we realized why we were the only ones standing outside. The howling wind wrapped around us and tugged angrily, threatening to knock us from our precarious perch. I stood petrified in the center of the deck, while Matthew inched his way to the edge in search of “better photos” (certain death). After nearly being blown overboard and subsequently threatened with divorce, he finally agreed to go back indoors and take pictures behind the relative security of the glass windows. 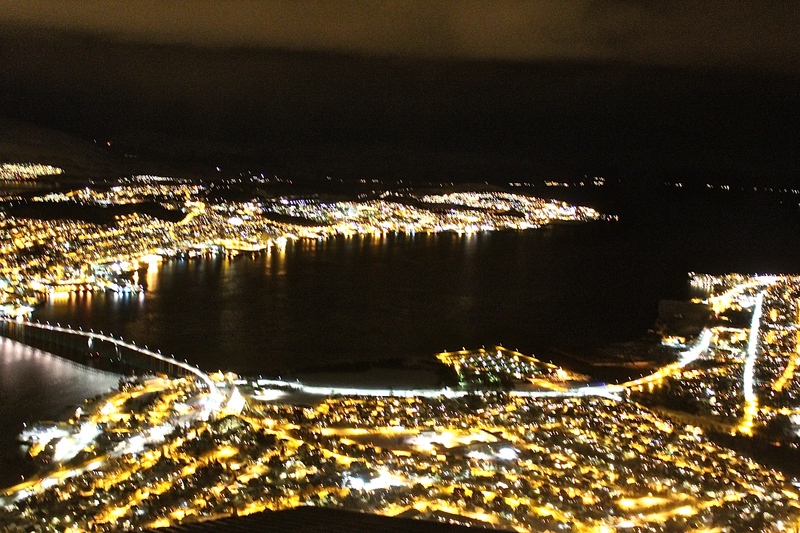 The Tromsø Bridge crosses the Tromsøysundet strait, linking Tromsdalen on the mainland and the island of Tromsøya. Inside, we hit the moocher’s jackpot — a group of Norwegians who’d come for a lecture on the Northern Lights were short by two people. The cafe manager graciously gifted us with their unclaimed meals (more reindeer steak and baked potatoes), and we enjoyed a cool slideshow, although we couldn’t understand a word anyone said. Bellies full, we decided to venture outdoors one more time before heading home on the funicular. This time, we circled around the building, which acted as a windshield and protected us from the worst of the onslaught. The city stretched out below us, its twinkling lights defining the shape of the island and the boundaries where the ocean’s limitless blackness began. Behind us huddled row-upon-row of mountains, made stoop-shouldered by their heavy blanket of snow. Scrawny posts linked by a limp rope marked land’s end and provided our only warning: step on the cresting snowbank beyond and risk triggering an avalanche. Yep, beautiful scenery, but a bit ominous nonetheless. Ølhallen is Tromsø’s oldest pub (1928). Women weren’t allowed inside until the 1960s. After our hair-raising experience on the mountaintop, we decided liquid fortification was needed, so we headed to Mack Brewery’s Ølhallen (Beer Hall). 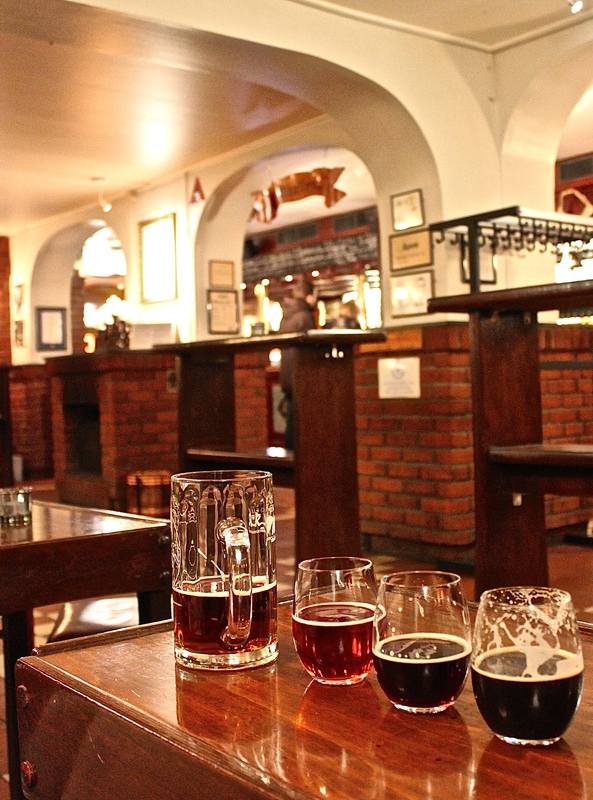 A huge blackboard of beers confronted us, making it hard to pick just one. The bartender came to our rescue with small glasses just perfect for creating your own flight. We decided upon a beer in each category (pilsner, lager, porter, stout, etc.) and sat down for a taste test. I’m no beer expert by any means, but my favorites were Nordlys (“Northern Lights” — a porter) and Isbjørn (“Polar Bear” — a pale lager), which I enjoyed as much for the awesome names as for the flavors. We finished off our night by taking our photo in front of the pub’s polar bear. The poor guy had been denuded of his claws either by souvenir hunters or by the pub’s owner (perhaps in an effort to prevent stumbling drunks from being skewered). Then we staggered home for a little sleep before our dogsledding run the next day…. 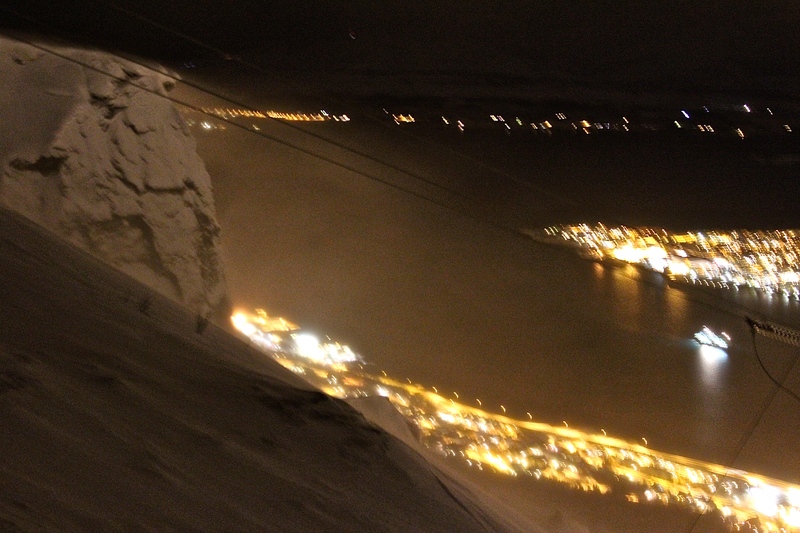 The view of the Cafe from the Fjellheisen — note the snowbank. I’d be mad, too, if someone plucked out my fingernails. Our bartender’s nifty shirt tells you where Tromsø is located. Previous PostTromsø & Santa’s ReindeerNext PostTromsø: Dogsledding Day! Hi Kimberly, I enjoy reading your blog entries.